Deb Rhymer struts the blues with a sultry, uptown West Coast sound. Drawing on the classics, from the heyday of the Chicago shouters to the strong song writing women of today's North West blues scene, Deb delivers a funky, soulful and sophisticated blues. Deb Rhymer and her band is a mainstay at festivals and clubs and are the hosts of one of the most popular and longest running blues jams in the Pacific Northwest. Deb is backed by a top notch band that includes Canadian veterans Kelly Fawcett on guitar, Andy Graffiti on drums and Clayton O’Howe on bass. Following up her well received first album of covers, Rhymer decided it was time to get serious about writing her own material for this new release. In collaboration with some of her community’s strongest writers and players, she got some fine results. From rocking to swinging, from tough to tender, there’s plenty here to please your ear. The album also features appearances by special guests David Vest, Bill Johnson, Gary Preston, Gene Hardy, Wynn Gogol, Neil Taylor and Randy Oxford. 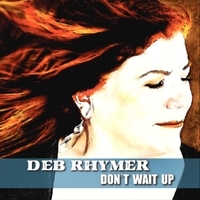 Deb Rhymer`s "Don’t Wait Up" is a great recording. “Old school blues done the right way.” - Gary Kendall, Juno and Maple Blues Award winners Downchild Blues Band.